To Cite: Rahpeyma A, Khajehahmadi S. Saddle Nose Reconstruction with Bone Graft in Multiple Facial Fracture Patients, Iran Red Crescent Med J. 2017 ; 19(1):e23925. doi: 10.5812/ircmj.23925. Background: Saddle nose deformities mostly result from trauma. Most reports of saddle nose correction after trauma relate to isolated fractures, but in this article the experience of the authors is presented in relation to bone grafting for the correction of the saddle nose in multiple facial fracture patients. Objectives: The current study aimed to report the results of a protocol for choosing the source of bone graft for dorsal nasal bone grafting in acute trauma patients with multiple facial fractures. Patients and Methods: In a retrospective study, archived files of maxillofacial trauma patients who were treated between 2005 and 2012 at Mashhad Emdad hospital (a level one trauma center) were reviewed. 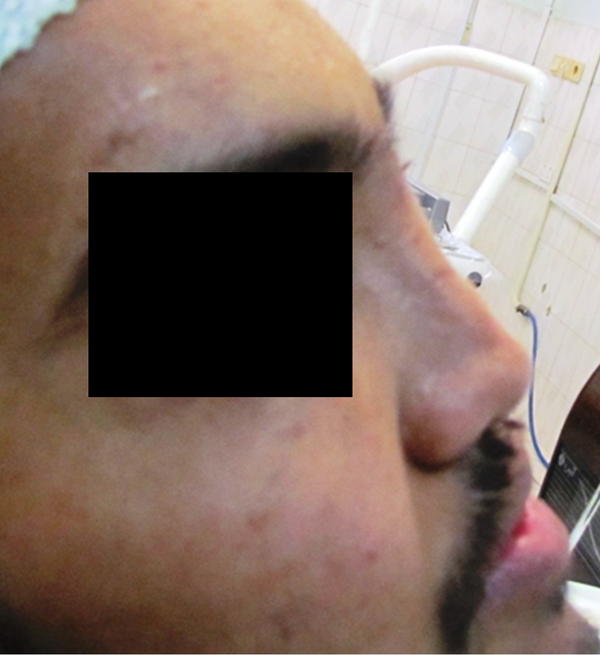 Cases were selected in which a traumatic saddle nose deformity concomitant with other facial fractures had been corrected with dorsal nasal bone grafting. The donor site, type of fixation, access to the dorsum of the nose, associated facial fractures, shape of the graft (cantilever or L-shaped), and plane of dissection in the dorsum of the nose (subperiosteal or subcutaneous) were assessed. Results: There were 11 patients treated using this method. The male-to-female ratio was 7:5. One miniscrew with the lag technique was the preferred method for the fixation of the dorsal nasal bone graft. Splitcalvarial bone graft was the most commonly used type of bone graft. 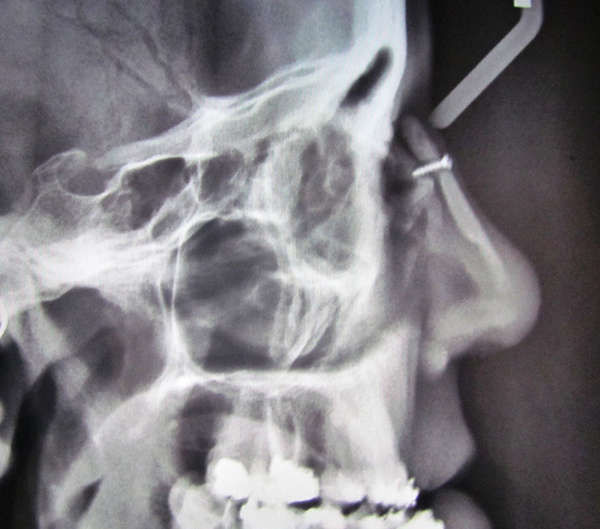 An open rhinoplasty approach and maxillary degloving were two commonly used incisions, and the most commonly associated fractures were maxillary Lefort fractures. The cantilever design was used in eight patients for the correction of the saddle nose deformity, and in four patients the bone graft was inserted into the nose in the subcutaneous plane. Conclusions: Saddle nose reconstruction with bone graft in multiple facial fracture patients is a predictable method if surgical accesses to the region are carefully designed, considering the accompanying fractures. Saddle nose deformities mostly result from trauma (1). Other causes of this deformity are the over-resection of the nasal septum during septorhinoplasty; infections such as Wegener granulomatosis, leishmaniasis, and leprosy; and congenital conditions, like syphilis and hereditary ectodermal dysplasia (2-5). These deformities can be classified as mild, moderate, or severe (6). Another classification approach is pseudosaddle, slight saddle, and extensive saddle nose. Minor, major, and extensive saddle nose are other terms used in articles to describe different stages of this condition (7, 8). Alloderm, septal, and conchal cartilage are recommended for the reconstruction of the dorsum in mild cases (9, 10). However, moderate to severe saddle nose correction needs alloplastic materials, a rib graft, and/or bone grafting (10-12). The sources of the bone graft in this topic are the split calvaria, lateral ramus / the body of the mandible, iliac crest, radius, tibia, metatarsals, and inferior turbinate (12-18). Most reports on saddle nose correction after trauma consist of pure saddle nose deformities, but in this article, the experience of the authors is presented concerning bone grafting for the correction of saddle nose in multiple facial fracture patients to prevent cicatrical soft tissue contracture over the nose and to improve the results of facial fracture treatment with the benefits of primary bone grafting in an effort to correct all deformities during the initial operation. The importance of the dissection plane in the nose, to prevent graft exposure to the nasal cavity, and choosing the proper tracheal intubation route that allows for the concomitant treatment of facial fractures and saddle nose deformity, especially those that are involved with the occlusion, are emphasized. The current study aimed to report the results of a protocol for choosing the source of bone graft for dorsal nasal bone grafting in acute trauma patients with multiple facial fractures. In a retrospective study, archived files of maxillofacial trauma patients who were treated between 2005 and 2012 at Mashhad Emdad Hospital (a level one trauma center) were reviewed. Only cases in which a saddle nose deformity had been corrected with dorsal nasal bone grafting were selected for inclusion in the study. Inclusion criteria consisted of traumatic saddle nose concomitant with multiple facial fractures. Instances of a pure saddle nose deformity or a remaining collapsed nose from previously treated multiple facial fracture patients were excluded from the study. The donor sites, type of fixation (miniscrew, miniplate, microscrew, and nylon suture), access to the nasal dorsum (bicoronal, open rhinoplasty, maxillary degloving), associated facial fractures, the route of tracheal intubation (oral, submental, or tracheostomy), shape of the graft (straight or L-shaped), and the plane of dissection in the dorsum of the nose (subperiosteal or subcutaneous) were assessed. We have a protocol for choosing the source of the bone graft in our department for severe saddle nose correction: In patients without an associated trauma, a calvarial bone graft is the treatment of choice. In patients with acute head trauma or a recent craniotomy, it is the anterior iliac crest. In patients with both head trauma and orthopedic problems in their lower extremities, the lateral mandibular border is considered. All patients were recalled and lateral cephalometry and CT scans were obtained. Follow-up time, resorption of the bone graft, the need for removal of fixative appliances, and the position of the nasal septum were checked. Donor site morbidity was also evaluated. Twelve patients were treated using this method. The male-to-female ratio was 7:5, and the mean age of the patients was 23 ± 5 years. 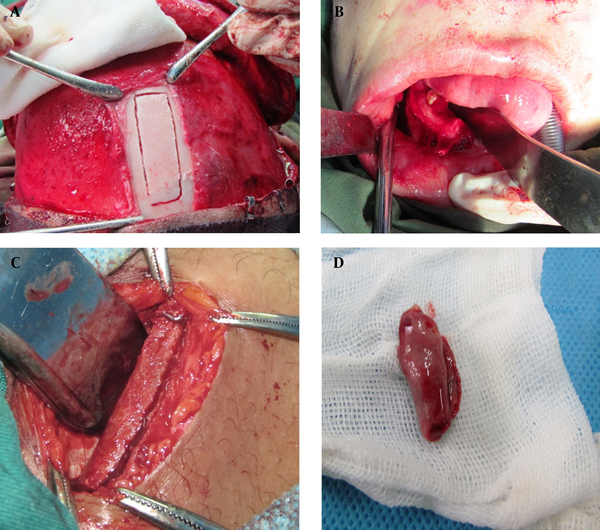 Split calvarial bone graft (8 cases, 67%), lateral ramus /body of the mandible (2 cases, 17%), and the anterior iliac crest and inferior turbinate bone (1 case each, 8% and 8%) were used as bone grafts for the correction of a saddle nose deformity (Figure 1). a) Calvaria; b) Lateral mandible; c) Anterior iliac; d) Inferior turbinate. In 11 patients, one miniscrew had been used for the internal fixation of the bone graft with lag technique. Miniscrews (2 mm in diameter with a length range of 9 - 13 mm) were used for graft fixation to stabilize bone in the nasofrontal area. There was no case of miniplate or microscrew fixation of the bone graft to the frontal bone. In one patient, in whom inferior turbinate bone was used as dorsal nasal support, a percutaneous nylon suture was used for bone graft stabilization, just like in dorsal cartilage graft fixation methods. An open rhinoplasty approach with a horizontal step in the columella was used in six patients, and maxillary degloving was designed for five patients. In one patient, no endonasal incision was used, and the graft was inserted using the superior surgical approach (bicoronal incision). In patients in whom a split calvarial bone graft was used (eight patients), the parietal bone was the only site used as bone graft donor site. Bicoronal incisions were used in half of the cases for both access to the calvaria for obtaining bone graft and simultaneous access to the frontal bone, frontozygomatic suture, and zygomatic arch. In the other four patients, a separate scalp incision was used over the parietal bone to harvest the bone graft, which was inserted into the nose through inferior incisions (open rhinoplasty or maxillary degloving). Among the 12 trauma patients in this study, the most common accompanying fractures were Lefort fractures (six patients). Panfacial fractures were present in two patients, and two others had naso-orbitoethmodial fractures (NOE). Two cases of frontal sinus fracture accompanying other facial bone fractures were also recorded. A cantilever straight design was used in eight patients, and an L-shaped bone graft (dorsal bone graft interlocked with columellar strut) was used in three patients (Figure 2). In these three patients, the interlocking approach (tongue in grove) was used to connect the two grafts in the dorsum and columella. In the one remaining patient, where inferior turbinate bone had been used for the saddle nose reconstruction, the whole bone was used as a dorsal support bone graft. In four patients, the graft was inserted through the bicoronal incision and in the subcutaneous plane. 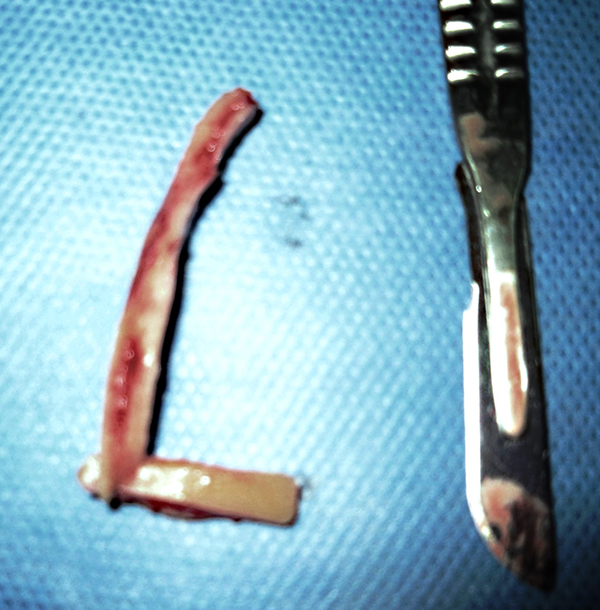 In three of them, the nasal incision was used to place the end of the bone graft below the lower lateral cartilage. In other cases, the graft was obtained from sources other than the cranium (four cases), and in three cases an L-shaped graft from the cranium was used. In one panfacial fracture patient, the graft was inserted from below, in the subperiosteal plane. Submental and oral intubations were equally common (50%) and were used to obtain tracheal intubation. There was no need for tracheostomy in this series. Upon follow-up, two patients (17%) needed revision rhinoplasty to rasp the horizontally over-augmented nasal dorsum and to correct the filled nasofrontal angle. There was a need to remove three miniscrews (3/11). The nasal septum was deviated in one patient, as revealed by a postoperative CT scan, and a case of nasal septum perforation as a complication of maxillary degloving incisions was present. There was a case of alopecia in the calvarial donor site. One patient needed orthognathic surgery (BIMAX), after the orthodontic preparation for correction of acquired post traumatic Class III malocclusion. Correction of saddle nose deformity after trauma with autogenous bone grafting is an acceptable method. This study showed that the results are predictable in long-term follow-up, although this method has its own drawbacks, such as a stiff nose tip (19). A split calvarial bone graft was the most commonly used bone for the reconstruction of a saddle nose deformity. It is used in augmentation rhinoplasty for Asian patients, reconstruction of the nose in cleft lip/palate patients, and in revision rhinoplasty after an overzealous reduction of the nasal septum (20-22). It is a thin bone; therefore, in cases requiring a thick bone, a full-thickness cranial bone harvest should be considered, or sources like anterior iliac bone should be used (23). In situations in which neurosurgeons have recently elevated a bicoronal flap and have carried out a craniotomy, they will not allow the same flap elevation in near future, in accordance to the result of the study that showed that monocrtical block harvesting from the parietal bone significantly decreases the skull’s strength (24). In this situation, other sources of autogenous bone grafting should be sought. Inferior turbinate bone, among the available donor bone sources in this article, has the least amount of bone, so it is useful for the correction of mild-to-moderate saddle nose deformity (25). In trauma patients in whom maxillary down-fracturing for mobilization of the fractured maxilla is in the plan, it provides excellent access to the both inferior turbinates. The lateral ramus/body of the mandible provides an excellent donor site alternative for nasal reconstruction in maxillofacial trauma patients with head injury and orthopedic problems. The region shows a wide variety of anatomic differences among patients. 3D multislice CT scans allow for reproducible measurements of the area and volume of the region before operating (26). In some cases, the quantity of the bone is not suitable for this topic. The probable complication is injury to the root teeth and inferior alveolar nerve, with altered sensation in the lower lip. 1) The need for a cantilever or L-shaped bone graft should be carefully assessed before designing the inferior nasal incisions. If the L-shaped design is considered, then maxillary degloving incisions should not be used. A separate mid-columella incision is needed when a maxillary degloveing and L-shaped graft is designed to correct saddle nose deformity (30). Note that the graft undergoes little resorption, but it is not consolidated with the underlying bone. Cantilever bone grafting was the most used nasal onlay bone grafting technique. It is in line with characteristics of a true saddle nose, in which the bony and/or cartilaginous portions are depressed but the projection of the nose is generally preserved (31). In situations where the nasal tip support is lost, then there is need for columella strut grafting, which was obtained in our study through L-shaped bone grafts (25%). 2) Associated facial fractures may need simultaneous open reduction and internal fixation, especially if the fractures involve the occlusion or necessitate special attention to tracheal intubation (. If the anterior teeth are present and there is no need for long-term ventilation, then submental intubation is the route of choice (32). 3) The need for the removal of the miniscrew (27%) is high; therefore, using resorbable screws in such a case is a sophisticated solution (33). 4) Saddle nose is always accompanied by a fractured and displaced nasal septum. Addressing this problem before dorsal nasal bone grafting will prevent functional nasal problems with breathing, despite a straight, normal-looking nose (34). It should be noticed that saddle nose deformity has paramount importance, both in terms of functionally and from an esthetic point of view. Management of the septum in saddle noses, grafted with the cantilevered bone as the dorsal nasal support, should aim to prevent posttraumatic airway obstruction by reducing the septum to a midline position (35). Dorsal support is not the function of the septum in these special cases. It is important to understand that, in traumatic saddle nose, the fractured septum role is important, but in severe cases support is obtained from cantilevered dorsal onlay bone graft, not from a repositioned and reduced septum. 5) Obliteration of the nasofrontal angle is a known complication of saddle nose deformity reconstruction (Figure 4) (36). This problem is less obvious if the preoperative saddle nose condition is severe. If the angle becomes obtuse after insertion of the bone graft, then removing the bone graft and deepening the nasofrontal region with a large round bur or a chisel is advised. This is most easily performed when the bicoronal approach is used to access the nasofrontal region. 6) NOE fracture has nasal component that is very similar to the condition of saddle nose deformity. Dorsal nasal bone grafting is essential in 42% of NOE fractures (37). The nasal septum, nasal bones, and frontal process of maxilla are fractured in severe saddle nose injuries; all of them are important structures that normally support the dorsum. Medial orbital bone fractures and medial canthus displacement are the two added features observed in NOE fractures. It is probable that surgeons manage severe nasal collapse with onlay bone grafting, while the actual problem is an NOE fracture. In this situation, traumatic telecanthus and acquired enophthalmus resulting from neglected medial blow out fractures are difficult to manage secondarily. Performing a maxillary osteotomy to correct an acquired post-traumatic Class III malocclusion, when L-shaped grafts have been used previously for the correction of saddle nose deformity, requires an extra osteotomy to release the end of the L-shaped graft from the maxilla in the anterior nasal spine (ANS) region, and the surgeon should insert a new strut graft from an intraoral route during orthoghnathic surgery to maintain or improve the tip projection. If the location of the nose and paranasal region is favorable, but the dentition is posteriorly positioned, then a modified Lefort I osteotomy with a horizontal cut beneath the nasal floor, at least five millimeters above the apex of maxillary anterior teeth, is indicated (38). Saddle nose reconstruction with bone graft is a predictable method, if a carefully designed surgical access to the region is used, one that considers the accompanying fractures and the route of tracheal intubation. Special attention should pay to the need for strut grafting before beginning any soft tissue incisions. Authors’ Contribution: Study concept and design: Amin Rahpeyma; acquisition of data: Saeedeh Khajehahmadi; analysis and interpretation of data: Saeedeh Khajehahmadi; drafting of the manuscript: Saeedeh Khajehahmadi; critical revision of the manuscript for important intellectual content: Saeedeh Khajehahmadi; statistical analysis: Saeedeh Khajehahmadi; administrative, technical, and material support: Amin Rahpeyma; study supervision: Amin Rahpeyma. Funding/Support: This study was supported by grant 940121 from the vice chancellor of research of Mashhad University of Medical Sciences.